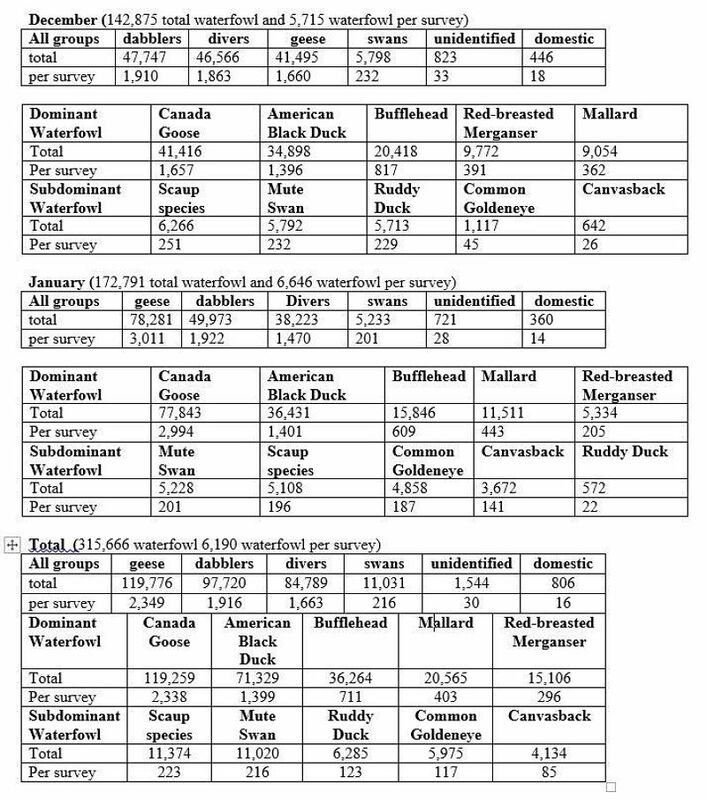 The early winter portion of this season’s waterfowl survey was held on December 4, 2016, the late winter count on January 29, 2017. With the 2016-2017 waterfowl season completed, the Lloyd Center has been surveying winter waterfowl for 30 years! Temperatures were seasonable for the December survey, and 5,297 birds for the month was the highest in nearly a decade, an increase by 902 birds from last December. The generally mild fall and winter, however, likely reduced the January count. A rare occurrence of no ice or snow cover whatsoever, the balmy January count was 7,100 birds, a decline of 1,535 birds from the last January survey. The numbers, however, were still one of the higher counts obtained over the past decade. 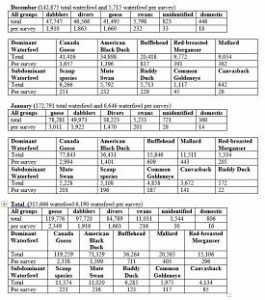 The total waterfowl survey count of 12,397 birds was the second highest over that timeframe. For common species in the December count, Mute Swan increased considerably as did Canada Goose, Mallard, Gadwall, Red-breasted Merganser and scaup species. American Wigeon, a less common species, showed the largest increase and has become more abundant in recent years. 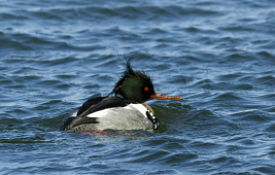 Declines occurred for Bufflehead, Common Goldeneye, and Hooded Merganser. In January, the largest change was a big decline for Canada Geese, the one species likely feeding on the snow-free landscape. 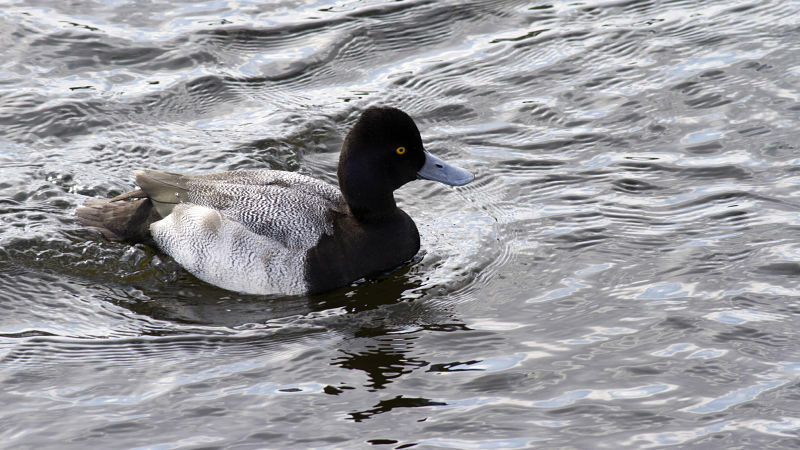 The highest declines otherwise, occurred for Mallard, Bufflehead, Ruddy Duck, Gadwall, Hooded Merganser, and scaup species. Common Goldeneye numbers were low considering this is often an abundant winter species. Mallard, like Canada Geese, likely had available food inland at freshwater areas, and our numbers don’t reflect true abundance of these species. In fact, the high abundance of Canada Geese explains the high waterfowl totals of recent years. American Black Ducks increased modestly for both surveys compared to the prior year’s count, and in January was the largest increase of any species. A summary of 25 years worth of data (1988-2013) focusing on dominant species is summarized in the displayed chart, and includes results for each month as well as the survey overall. The data shows that Canada Geese have been by far the most abundant waterfowl species in the region over the timeframe studied. This is due in large part to the presence of both resident populations within Massachusetts and migratory populations from far north that all converge on our estuaries each winter. The adaptability to humans use has caused the resident population to increase and displace the migrants to some degree. American Black Ducks are the one dominant dabbler with a robust migratory population arriving mainly from boreal areas northward, and from within the Atlantic flyway to the estuaries and salt marshes. 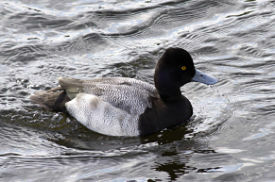 Competition with Mallards which have also acclimated to people has negatively impacted black ducks, which have declined as a breeding species within Massachusetts. Mute Swan, a non-native species, is yet another species benefitting from people and which have been a subdominant species. 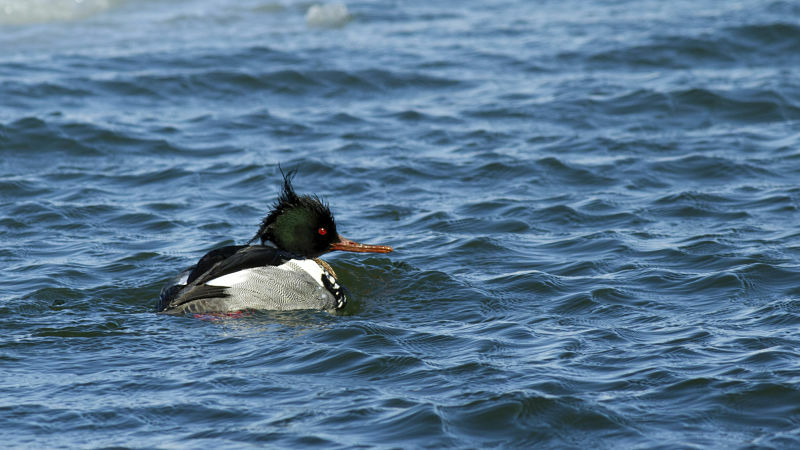 While Bufflehead and Red-breasted Merganser are the only two highly abundant divers, the diver group almost exclusively represented the subdominant species category. 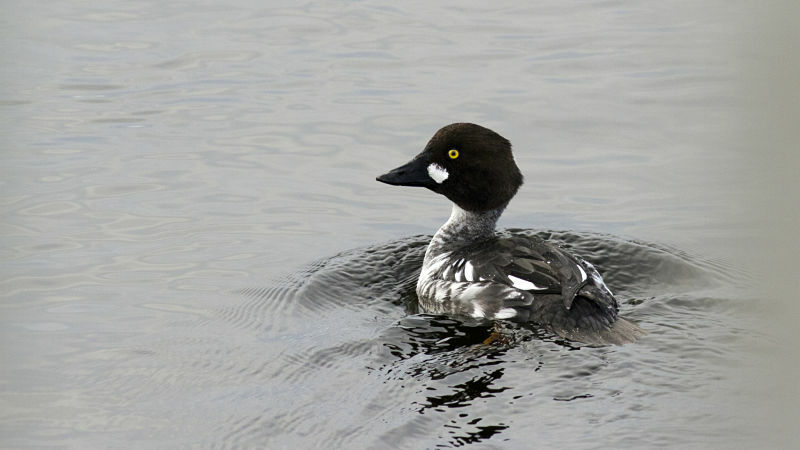 The diversity of diving ducks is due in part to their adaptability to feeding at greater depths offered by many of the estuaries and coastal ponds in the study area. As a group not closely acclimated to human use areas, divers are a critical component of the natural biodiversity present within the winter waterfowl community throughout the region.